Time to attend my 7th Scottish Juggling Convention in a row! My wife Rach dropped me off at Kinning Park, but she wasn’t able to stay this year. I set up my double airbed in the usual corner of the downstairs hallway and was ready for juggling action! The pass this year was an excellent rubiks cube and I was given a green convention t-shirt (instead of the black one on sale) for offering to help out over the weekend! There were 120 attendees this year, which was the highest figure yet. 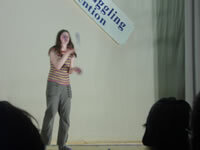 My juggling aims were to improve my plate manipulation, 5 ball juggling and devilstick skills, and I was able to get in plenty of practice time on each over the course of the weekend. While I was chatting to Andy Wilson, his girlfriend disappeared and brought in his birthday cake which was yummy! Thick snow outside when I awoke frostily at 6am on the Saturday morning! The heating wasn’t working in the building, but thankfully I had packed a hot water bottle and I sat up for a while reading juggling books until I felt warm enough to try and sleep again! More devilstick practice as I have created a list of 120 trick to practice, and just by going through them one at a time, I am feeling my skills really improving! The venue for most of today was Bellahouston Academy. Lots more room than the Science Centre we have used for the past few years, but not as attractive a venue! 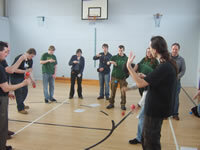 Only a few people associated with Stirling Juggling Project managed to make it along to the Convention. It was good to catch up with Tim Hamlet, Allen Goldie & Sam. 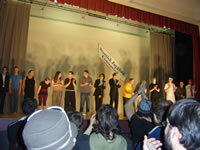 This convention was sadly missing the wonderful Captain Dunc and George though! There weren’t loads of workshops on offer this year. Just as much my fault as anyone else’s as I could have chosen to run a couple if I had wanted to! I only attended the Kendama Workshop ran by Matt Hall and the Void. I bought a Kendama afterwards! The show was hosted by Little Paul. The venue was much better than in previous years. Lighting and music went without any hitches which was a huge bonus over the glitches in previous years! Matt Hall Diabolo routine as awesome as always! Ball Juggling. One of the highlights of the show. His musicality was great. Contact Juggling comedy double act. I don’t normally enjoy any sort of contact juggling, but these guys were great! 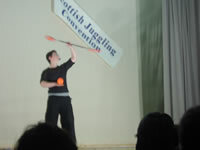 2 person club juggling and passing – highlight of the show. Funny and sophisticated! Ball juggling routine – One to watch for future years! “Don’t Drop me Now” acro balance routine! Awesome and very entertaining! 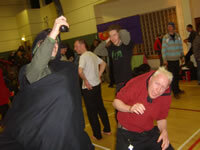 I didn’t attend the Ceilidh, but people had a great time at it. I preferred practicing devilstick and plate manipulation for most of the night. I also sat at the registration desk and got to meet lots of people I hadn’t spoke to before. I got to meet a few jugglers from the Midlands area which is where I will be moving to in September, so it was good to do a bit of networking! A bit hit and miss. Matt did a good job of hosting it, but it took a while before people were quiet enough for us to enjoy it. First routine was a drunken adventure as 2 girls got up and lead a mutiny on stage, finishing off by showing us their pants! One guy rode a tiny bike. Matt did some Cigar Box stuff, and Meghan did contact Staff spinning. During the night, I was tucked in by at least one person when my sleeping bag fell off! Bellahouston Academy was the venue for everything today, and I was all packed and headed over after a quick breakfast, walking there with Paul who attended my Christian Juggling workshop at the BJC Cornwall several years ago! I played Beach Flingo with Max Marshall and we swapped some ideas for routines, and I tried to grab a shot of someone’s snakeboard, but was always beaten to it by other people eager to try it out! 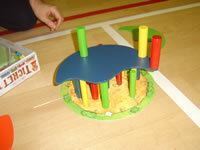 I also played alongside Aidan and Parrott on various games such as Junglejam and this balance game (see photo)! The Juggling Games weren’t that exciting this year. Miles did a great job, but there didn’t seem to be much enthusiasm. There weren’t any prizes for the winners (normally its just a biscuit or something trivial)! I won the stredging with Max, but because we misheard and didn’t realise we had to sit down afterwards, we were disqualified! 3 of the 4 world records shattered this year. In the 3 Haggis Juggle, I made it to the last 3 or 4 participants and managed approx 8mins, which would have easily been enough to win the title a few years ago), but next year it will be mine!